STAINLESS STEEL TRIANGULAR TRIPOD AND GAUZE (Mesh) MAT SET. A convenient set of five SC92000 stainless steel tripods and five SC92002 stainless steel gauze/mesh mats. Manufactured solely for us and only available from Scientrific, our product is NOT AVAILABLE ELSEWHERE. These tripods set a new standard of excellence. Made from non-rusting, incredibly strong 8mm diameter welded stainless steel rod with polished welds and sturdy non-slip silicon feet. Height: 200mm, top: 145x145x145mm, base: 180x180x180mm. 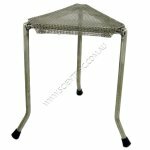 We highly recommend using our SC92002 safety mesh with this tripod. SC92002 STAINLESS STEEL TRIANGULAR GAUZE (MESH) MAT details. Made specifically for us to suit our SC92000 stainless steel tripod, our product is not available elsewhere. Our specification was for a super safe product that could not fall off our tripod or be easily caught on cuffs and the factory really delivered! The mesh size has been selected to minimise hot spots while ensuring maximum durability and because stainless steel is a poor heat conductor this mat is safer than iron ones. Suits tripods with up to 145mm long sides. Mesh size: approximately 48 strands of wire per 10cm.